WANTED: a dedicated team of critical and creative individuals to help continue the reach and impact of OPENWIDE. If you are interested in gaining some hands-on experience with the publication, consider applying to be part of the team! 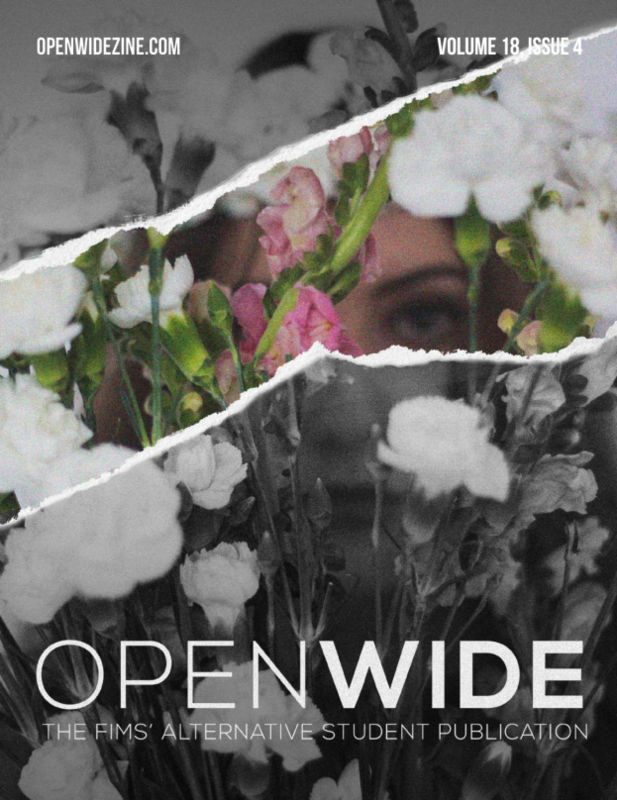 Email applications to openwidezine@gmail.com by 11:59pm on April 7th. A leadership role with the purpose of assisting the editor-in-chief to direct the vision and operations of OPENWIDE. Involves coordinating the editorial team, as well as staff writers and contributors. Graphics Editor(s): Responsible for handling the graphics content and layout for OPENWIDE in print. Will also work closely with the web editor to co-produce online graphical content. Mandatory experience in Adobe Photoshop, InDesign, and Illustrator. Please provide a portfolio or a link to some of your work. Photographer: Responsible for coordinating and shooting both the issue covers and images for inside the magazine. Access to your own equipment and prior experience is imperative. Please provide a portfolio or a link to some of your work. Promotions team: Responsible for networking; coordinating OPENWIDE’s social media presence (along with the web editor), connecting with the FIMSSC street team, and linking OPENWIDE to the community. Will coordinate promotions/advertising, and play a prominent role with any OPENWIDE community-related events. Web Editor: Producing the content for the OPENWIDE’s online section. Includes transferring print content to online form, as well as publishing/formatting online stories and advertisements. Will work with the graphics editor for online graphical content, and the marketing coordinator for the social media content. Assistant web editor: Assisting the web editor with maintaining online content. Must be cooperative in a group setting. What prior experience/qualifications do you have that would help you excel in each position you have applied for? In your opinion, what is/should be the purpose of the OPENWIDE? Are there any changes you would like to see in OPENWIDE next year? If yes, how would you go about implementing them? If no, explain why you think the current structure is strong. Presidant Donald Trump and Dr. Evil walked in a Tim Hortons. Together they ordered two double doubles, two turkey sandwhichs and a box of 40 timbits. Than Donald offered to pay, and Dr. Evil happily accepted. Please attach a short sample of your written work. Please avoid lengthy essays – concise is better. Written responses, articles, etc. are all acceptable. Applicants for the Online positions are encouraged to attach a sample page from a personal web design project, or a screenshot from a personal website or blog (please note that this is not mandatory). Please provide a visual portfolio or a link to where we can view some of your work. A cohesive vision is integral to a smooth final product. ← Issue 4 is Available!